I asked my tumblr followers what I should blog about and aricmonkeys asked if I’d write about books, so I thought today I’d review one of my favourite books of all time and talk about the books I’ve taken to Ecuador with me! 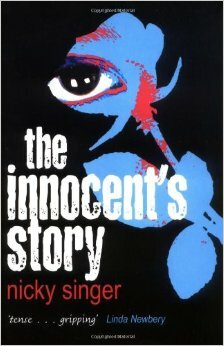 Whenever someone asks me my favourite book, I saw ‘The Innocent’s Story’ but to be honest I don’t really have a favourite. I have lots of books I like in different genres for when I’m in different moods, but this is a book I read probably seven or eight years ago and I’ve not read it recently (it’s on my to do list to reread) but it still sticks with me as one of my favourite stories. In a nutshell, the narrator’s character and her sister are caught in a shopping centre bombing but she doesn’t die – she ‘wakes up’, I guess, as this sort of mist and she has to live inside peoples brains to survive. She’s looking for her sister and trying to find a way to survive and it’s a very thought provoking book regarding the after life, morality and the love of a family, I guess. I won’t spoil the ending, because hopefully this review will make you want to read it, but it’s a little bit sceptic and doesn’t quite fit with the rest of the book (if I remember correctly). But it’s so superbly written in a way that isn’t overdone or over complex that it makes up for the questionable ending. Does that count as enough for a review? I want to talk about the books I’m going to read while I’m away, I’m excited. I’ve got a combination of books I’ve read before and new books and I’ll take you through the new ones first. At first, this book seems like everything I wouldn’t read – ‘There are a lot of reasons why Teresa and Jase should steer clear of each other…’ – forbidden romance, no thank you. But then it gets a little stereotypical and apparently Jase has a secret that ‘he’s not ready to risk sharing with anyone apart from the people closest to his heart’. Forbidden fantasy romance, however, is right up my street. Thought apparently this is part of a series, so I’m not sure I’m going to take it any more because I don’t have the other books. I picked this up because it was on offer and Carrie Fletcher speaks very highly of it, alongside Rainbow Rowell being the author of ‘Fangirl’ which is a book about my life, I swear to god. Again, a love story that I wouldn’t generally pick up – if it doesn’t contain some element of magic or the supernatural I’m usually not interested but I love Rowell’s writing style and I trust Carrie’s judgement. I’m excited to see if ‘Eleanor & Park’ leaves as much of a mark on me as ‘Fangirl’ did. When I saw the trailer for this movie, I knew it was something I’d be interested in and not only because Dylan O’Brien stars in it. It’s fantasy, it’s adventure, it’s mystery, I’m very excited to read this but people on my tumblr told me I should take the whole series, so I’m going to save this one for the end of the trip so I can jump straight into the next one if I fall in love with it. I adore this series – I started it when I was 12, I think I got the first book free in one of those programs to encourage children to read even though as that point it was more difficult to get my nose out of a book. I have about five books in the series and I think I’ve read four of them, but I repurchased them all on my kindle for the trip and they’re quite simply written so they’re an easy read, but I love the humour and the fantasy and the image I have of David Tennant playing Skulduggery – this might be one of my favourite book series of all time. This book sky rocketed into fame when the movie with Logan Lerman and Emma Watson came out. I read the book because I wanted to understand it before I saw the film and I don’t think I’ve ever identified with a book so much. It’s a little difficult for me to read because I identify so much with the main character that it can be sad but I love the letter writing style and the realism in it, I love this book and highly, highly recommend it. I can’t wait to reread it. I love making posts like this because it really rekindles me love for reading. On the one hand, I hope I’m busy enough that I don’t have time to read in Ecuador, but conversely I’m taking a lot of books and I’d love to really reconnect with reading.